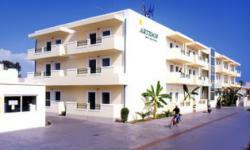 Artemis Hotel apartments is located in Lambi area, just 1km from the harbour and Kos town center. The most popular beach is just 150 m away. 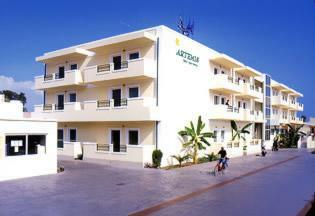 Artemis Hotel apartments, offers 60 comfortable apartments. Our professional and experienced staff will assist you in every way to make your holidays as pleasant as possible. Each apartment can accommodate up to 5 persons and features: Large balconies - Spacious rooms - Colour TV - Hair dryer - Air condition - Direct-dial telephone - Modern bathrooms with bath or shower Kitchenette with refrigerator, microwave, cooking-rings, kettle, toaster and filter coffee-machine. 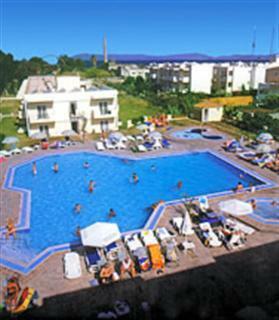 Artemis Hotel apartments, Kos, Greece also has the following facilities: - Open plan Reception with 24hrs service - Safety deposit boxes - Phone service - General information - Internet connection / e-mail / fax available - Car / motor bike rental - Satellite TV lounge - Bar - Cafeteria - Snack bar serving breakfast and lunch - Taverna serving traditional greek food - Large outdoor swimming pool - Sun pool terrace - Children's pool - Playground - Jacuzzi - Gym - Sauna - Mini market - Tourist kiosk - Parking area. At the Artemis Hotel apartments the day starts with a smile!